The post I wrote a few years ago on counting new and returning customers in MDX has proved to be one of the most popular here; it’s certainly a topic I’ve returned to a number of times for DAX, and other people (most recently Gerhard Brueckl) seem equally interested in solving this problem. However I had a comment from Sohrab Niramwalla yesterday which raised an interesting question: how do you could the number of customers who have bought from you in every time period from the beginning of time until the current date? 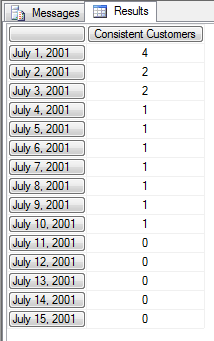 From the screenshot you can see that on July 1st 2001 there were purchases in 4 out of 6 countries; of those 4 countries, only 2 (Australia and USA) had purchases on July 2nd; both of those had purchases on July 3rd; but by July 4th only USA had seen purchases on every day since the beginning of time. Mosha’s technique for optimising count(filter()) calculations might also be useful here, although I have to admit I’ve not tested it to see if it does improve performance. It uses the generate() function to loop over ever date from the beginning of time to the current time period, and then redefines an inline named set (called customerset) on every step of the iteration to find the non empty countries. It doesn’t perform as well as the previous solution in this particular case, but if there were more countries that might change; a few tweaks to the code might also speed it up. I thought it was worth mentioning, though, for the novelty value. Chris, thanks for the answer, and for taking the time to provide a thorough explanation. I tried to bend the original query to suit my needs for a while, and realized that I was on the wrong path. in just under three seconds. Perhaps I botched something on translating the count(filter()) approach, but thanks for posting multiple approaches! Am I right in guessing that the second approach will also let me use the set of consistent customers in future steps, whereas the count(filter()) will only ever let me know how many, but not who? That’s interesting – I’m glad one of the solutions worked out! Re your question, it depends on what you mean by ‘future steps’. You certainly wouldn’t be able to refer to the inline named set in another calculation; you might also have problems referring to the named set in other parts of the same calculation. You could copy the calculation (I think you’d need to use a different name for the set if you had two calcs using this approach) and alter it so you showed the names of the customers, using the version of Generate() that concatenates strings (see http://www.mdxpert.com/Functions/MDXFunction.aspx?f=109). Sohrab, Could you post your tweaked MDX?